As regular readers know, I have a basal cell carcinoma on my jaw line, and since I have $10,000 deductible insurance and have had really bad experiences trying to get a straight answer on costs, I decided to be very proactive about researching my options. I’ve decided, and the treatment is today. No visible scar. Absolutely the best if you want it invisible e.g. in the middle of your face. At my first visit the dermatologist said, “Well, if you’re basically self-pay and want to keep costs down, there are other options.” He told me about ED&C and I said it sounds good. The first article was all I needed, personally. If costs were the same I’d go Mohs, but they’re not – not by a long shot. Lots more to say later, but I’ll sum it up this way: it was a lot of work to find out what I needed for an informed decision, but ultimately I’m quite satisfied. I feel like I knew the options and I could choose – not some unseen insurance person that I can’t talk to. I’m gonna predict that as information tools evolve – so getting this info isn’t such a struggle – more and more people will go high deductible. And, note: if an insurance company had said “You don’t deserve the best one (Mohs) – you get the quick/cheap ED&C,” it would have felt like the nastiest kind of rationing, but when I make the decision, it feels like freedom. I guess that’s what they mean when they talk about paternalism (where someone else, supposedly more informed, makes decisions for you because you’re not mature enough) and nannying (where someone else, supposedly well meaning, makes decisions for you because you’re not able or smart enough). Anyway, it took months and it was hard work, but I really like the result. More later. Bottom line, I’m spending an hour and a few hundred dollars instead of a full day and seven grand. Okay, time to push the Publish button and go get zorched and scraped! Good luck Dave! I hope there will be no re-occurrence. And thank you so much for sharing all this with us and making us all become more engaged and requesting that we are enabled to be empowered. The most important point you made was that you would have felt cheated if the insurance co. had said you didn’t deserve Moh’s, but having made the decision yourself you were satisfied. Do you think this had to do with having ‘skin in the game’ (e.g. cash) or the feeling of empowerment it gave you, or both? At any rate, glad it’s over with for you! Bev, it’s the whole package, not just the cash. I got my hands on the information, I asked about my options (repeatedly), and, all things considered, *I* chose. I’m starting to think that if they had HIGHER deductible plans, I’d be interested in that. Perhaps the only thing I’m willing to spend on is disaster insurance. Glad to hear it is sorted. I wish you a speedy recovery and zero recurrence! Pauline, as shown in my earlier posts, my previous BCC was around 1978 with zero recurrence, which is one factor in my assessing the odds. Dave, Way to lead the charge on proper medical procedure decision making! I’m continually impressed by your work in this area. And your willingness to share everything through social media and other venues is fantastic. You are making a significant and lasting impact on medical practice – congratulations – and thanks. Thanks, Jerry … it might be useful to compare my process with similar decisions you worked on in your business career. What similarities do you see in our approaches? What did you do in business when you wanted to make a good decision but you knew next to nothing, at the start? Wow Dave, big question! The simple and perhaps obvious answer is that the approach I followed (and apparently you are following in choosing a treatment) is to research the topic and get facts and opinions from as wide a variety of people as possible (until you start hearing the same things over and over again). I tried to listen to nuance and subtle differences, and probe people to explain things that might seem to be self-explanatory. Surprising details often emerge. QA people call it the 5 why approach – meaning to dig down 5 levels of why something failed, or occurred, or is the way it is. Next time you are in the Twin Cities I’d love to quick this topic around over dinner and a glass of wine. Let me know if this is of interest. Here’s an add-on note 2.5 years later, revisiting this post as I prepare for a speech in the morning. Boy, what we were doing back in 2012 is right on. Yeah, Jerry, next time I come to the Twin Cities we should get together and talk about reality. been a while since I checked in here. There is always much more to recurrence rates that just the published figures. In general we never ED & C on the face, not least of all because, if done right, the scar will be nasty. But also ED & C is much less effective in hair bearing areas – e.g. scalp and beard area. Why? Because the tumor can go down hair follicles, trying to scrape it out is like trying to shovel snow in thick grass, the follicles get in the way and the tumor has a passage to go deeper into the skin. With a tumor that size in that location the standard of care is Mohs surgery. Its fine if one does substandard treatments, we often do especially when cost is involved. The key is follow up to monitor for recurrence. The difficulty with ED & C is that the recurrence can be under the scar, so you have to wait for it to grow up and around the edge of the old scar to see it, i.e. the tumor has to get pretty big. Still it can work and hopefully it did, just make sure you continue to get a skin exam every year. The cost of a one stage Mohs and linear repair in my hands is about $1100. You can never guarantee ‘no scar’ even with Mohs, everyone heals differently. You probably saw the detailed results post … *all* the hospitals I contacted charged about the same. So, what might I have done differently? How would a patient like me find someone like you, who can do it for $1100? Are you in an urban center, remote rural, other? Great discussion – and thanks especially for the explanation about the hair growing areas. That hasn’t come up anywhere else. I’ll ask my dermatologist about it! In fact I think I’m going to make a new post out of your comment, to break this branch into a distinct discussion. I had to go look up where the rhomboid is – middle of the back http://www.physioadvisor.com.au/assets/256/images/14116256(300×300).jpg … since ED&C is about 10x more likely to recur than Mohs (according to the paper my doc cited), will you be able to keep an eye on it? One factor in my decision was that it’s easy to monitor my chin. :-) Your thoughts? My doc is also concerned, so he wants another look at it in about 8-10 months. Meanwhile, my wife will inspect it periodically, since, at my rapidly advancing age, I can’t twist around far enough to view it in a mirror. I always have to be aware that heaven-knows-who will read this someday in the future. Everyone who wants to take an active role in their decisions needs to do what they can to inform themselves about risks and trade-offs. I’m sure to you that’s no surprise, but in my experience folks who are new to e-patient haven’t always thought it through. In my view, in a sense it’s no different than any other type of emerging from total dependency on another for judgments and autonomy. For instance, when someone starts driving they can no longer depend on another to be safe on the streets; they assume that responsibility. In medicine, of course, we can share that responsibility with (and be coached by) clinicians who support our autonomy – that’s one reason I think it’s so important to find clinicians who welcome the engaged patient. I had a basal cell about your size. It was into the inner part of an eyebrow. I never officially got it diagnosed because…I didn’t want to lose an eyebrow and I was applying for insurance. But when I googled images there was no doubt at all. I’m 53, and light complected. I had been aware of this thing for well over a year. I had tried picking, sanding, scraping it off…Finally in desperation I spread some curcumin powder on it (I was aware it kills melanoma & dozens of other forms of cancer). Overnight – 2/3rds gone!! After a week of treatment it was totally gone. Found out this was nothing new & that vit C powder may ever work better. Cost of treatment: $8 (band-aids and a few curcumin pills). Try it!! Hey Kate – thanks for your story. Nor should you believe it just because it’s on the internet…but at any rate, here are some links…from the internet. The first a medical study done which shows that curcumin causes bcc apoptosis and the second talking about topical vitamin c and bcc (the internet is crammed with stories of topical vit C and bcc, Not as true for curcumin, but it has been done by others besides me). I just think it’s dumb to spend $500-$3000 on something that can be accomplished for less than $10. I’m trying to help! Also the third link tells of a curcumin coated band-aid made by J&J for wound healing. Granted it’s sold in India only. But the point is applying curcumin won’t do harm. So what do you have to lose by trying it? I’ve been taking curcumin pills for nine years. Clearly the pills didn’t cure or prevent my cancer. I believe that cancer cures via curcumin will depend on more direct application, such as injection into the blood stream (which is being tested for Alzheimer’s). No offense taken, Kate – I tried to word my reply thoughtfully. I do appreciate the links, though this time too I’m not taking the time to pursue them myself. Thanks for engaging in the dialog. Very interesting discussion, this. I am a Skin Cancer Physician, working in Australia. I am not a Dermatologist or a Plastic Surgeon, but a GP with advanced training in diagnosing and treating skin cancers. I have a Master’s degree in Skin Cancer and advanced surgical training in cutaneous surgery. Australia has the highest rates of skin cancer in the world, about 3-4 times the rates you have in the US or Canada. The vast majority of skin cancer here is treated by GPs like myself. Mohs surgery is rarely done here because of cost and it is hard to access – very few Mohs surgeons in Australia. The BCC on your jaw is a high risk one because of its size (1 cm or larger) and location. Facial BCCs and SCCs (squamous cell cancer) are a much higher risk category than ones elsewhere on your body. 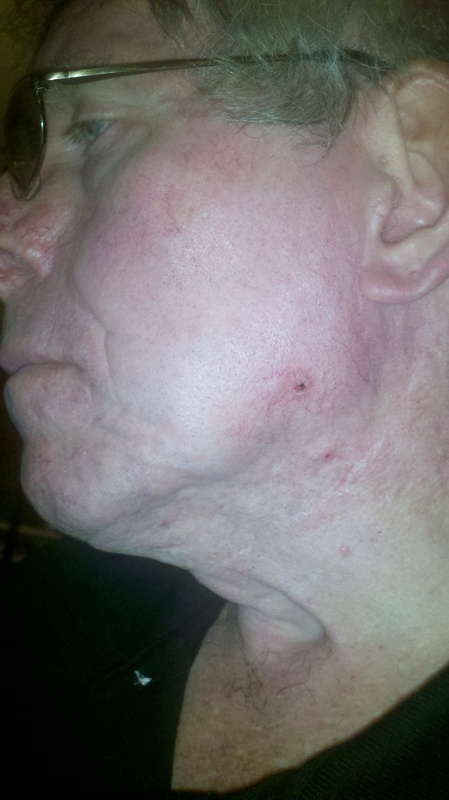 These cancers, called NMSCs (Non Melanoma Skin Cancers) have a higher rate of recurrence and of metastasis on the face. They do not metastasize through your lymphatics/blood but rather they have an affinity for nerve tissue and there is plenty of that on your face. Personally, I would only ever do ED&C on a superficial BCC, and not one on the face. In my opinion, the only safe treatment for the type of BCC you had is surgical – this allows you to know absolutely if the margins are clear or not. I would not have recommended Mohs surgery for you, just a simple elliptical excision with 5 mm borders, and direct closure or a rhomboid transposition flap to close the wound. Here in Australia, you would have paid maybe $200 out of pocket for the procedure. Medicare pays $200 for a simple excision on the face, and another $300 for a rhomboid flap repair on the face, and you would have paid a “Gap” of $100-$200 depending on the doctor you saw, so the total fee to the doctor here would have been $400 for a simple ellipse with direct closure to $700 for one with a rhomboid flap. I am not trying to scare you or anything like that about your decision to have the ED&C for your BCC….but in my opinion, you are taking a risk. The procedure you had has destroyed the superficial layer of the BCC, but you do not know for sure if there is BCC lurking in the deep dermis (deep layer of the skin) that was missed. You now have a flat scar there, which is exactly what a BCC looks like in the early stages…so if this BCC were to recur, you will not know about it for some time, and by the time you do, it will be possibly quite large in the deep layer of the skin (sort of like an iceberg – the visible portion is much smaller than the actual whole). At this stage, you will HAVE to have Mohs, and if the BCC attaches to nerve tissue, you will need radiation therapy. My advice is, keep a close watch on the scar. If possible, have a doctor check it twice a year with Dermoscopy, which will give you a much faster indication for BCC recurrence than if you are just checking it yourself on naked eye exam. Alternatively (and this is what I would do), have the scar excised with a 2-3 mm margin and the tissue sent for histology to see if there is any underlying BCC left that was missed by the ED&C. Best regards and good luck. Re high risk (1cm): in the paper my dermatologist showed me, on suitability of Mohs, 1cm wasn’t indicated as high risk. I don’t have the cite handy; do you have a reference at hand? This is the first I’ve heard about BCC metastasizing through nerves – everything I’ve seen has said it rarely metastasizes at all. Hm. In any case we are scheduled for a check in six months. Any other thoughts, anyone out there? I used Curaderm. Not FDA approved. However, I read the science and it felt right. It was an 11 week, not fun, experience. However, my BCC was 6 years old (missed by my dermatologist) and was sclerotic. I figured I would try it, and during the 11 weeks, I met with a radiologist at the cancer hospital here in Canada. I DID NOT expect it to work and I wanted to be prepared with another type of treatment. I did not want Moh’s. Anyway, it worked, and I had a 3 month follow up biopsy. That was 3 years ago. Our health care in Canada is free, so I can do whatever treatment I want. I went with $120 tube of Curaderm. This worked for my husband!! 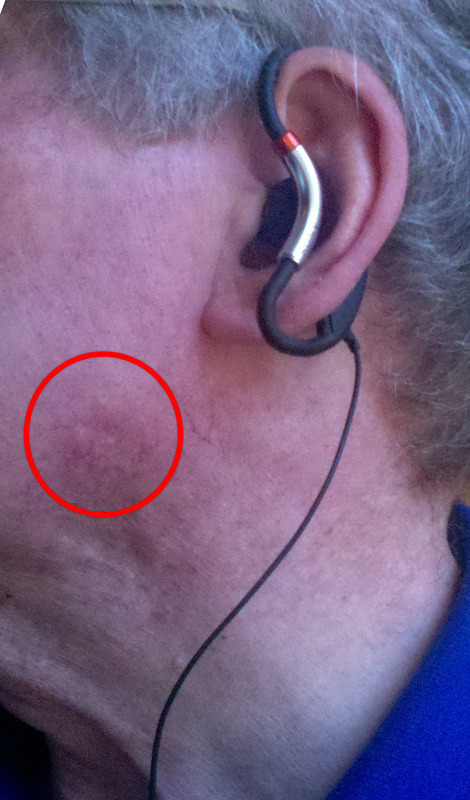 His doctor cut off the squamous cell from his lip, but it returned. We used Curaderm (BEC5) and it completely disappeared – that was 4-5 years ago. Nothing since. All, just to repeat my policy, I don’t know about this stuff; no endorsement implied by it being in the comments here. Generally, how much does the procedure cost? Hi Elizabeth – there is no single answer! At least not in the U.S.
How they bill for it varies all over the place (different billing codes used by different providers), how MUCH they charge for each billing code varies all over the place, and, much worse, in many cases there are secret price agreements negotiated between specific insurance companies and providers. I have basal cell carcinoma in my lower back and a doctor who is a friend of a friend said do Mohs surgery . after reading everyone’s post now i am not sure what to do. i have no insurance and have not money to spend so i need some serious replies from you guys :) . Sorry to say, you can’t get medical advice here … all we can do is talk about options. Somebody else might pop up with a thought but not likely. Re your other question, as I said above, basal cell carcinoma is not urgent, according to everything I read and heard from various docs. BUT this is the internet and you need to be responsible for your own reading & decisions. Also note the other options – excision (much much cheaper) and ED&C as described in this post, which ended up costing me <$700. But you have to be able to check it in any case to make sure it doesn't come back. So many stories end with “I figured if it was important they’d know,” but they’re literally not in a position to know how it’s going. If there’s anything visible about the lump you should be able to email them a picture, one way or another, but some practices aren’t modern enough to accept emails or photos yet. How did your doc say to care for the scrape and burn after he sent you home? I had one done at the first of August and I’m curious about the aftercare. Hi Debbie. I have only a vague recollection, but I don’t recall anything special: it was like any other scrape & burn. But I have no other idea what would be appropriate in your case – heck, I don’t even know if ED&C was appropriate for you. :-) I only recall that it was quick and easy. And of course I had a return visit in a few weeks to check it. Note: not surprisingly, this is for one of those crooked “we’ll write your homework paper for you” services. EDC is usually done in your doctor’s office. After numbing the area, the doctor scrapes the top layers of skin away with a spoon-shaped tool (curette). Then the doctor heats the surface of the wound with an electric current through a metal instrument or needle (electrosurgery). This helps control bleeding and destroys any cancer cells that remain.